The lonely life of a lighthouse keeper is certainly not for everyone, but on this California isle, visitors thrill to experience this unique piece of Americana – at least for a night or two. On East Brother Island, just inland from the coast of Northern California, heavy storms often crash against the island’s few acres, as the wind churns the slate-gray seas in San Pablo Bay. 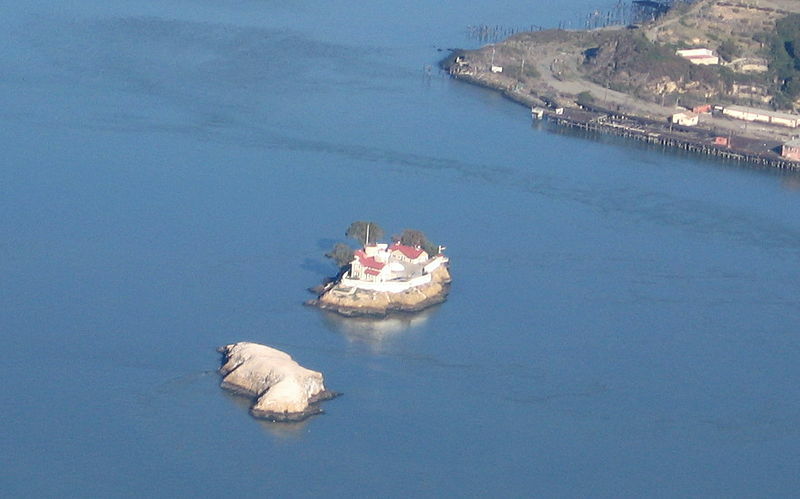 This solitary outpost, established in 1874 to mark the dangerous passage between San Pablo and San Francisco bays, still seems remarkably isolated – despite now being surrounded by a vibrant metropolis of nearly 7.5 million people. 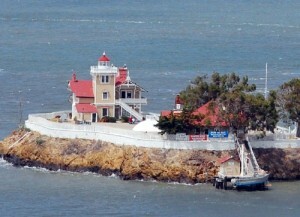 In the early days of the lighthouse, this isolation posed a real danger to the keepers who manned the island’s warning light and fog signal – strong waves would capsize their boats, the island was regularly laid waste by storms, and the chickens they kept had to be caged, lest they be blown clear across the bay. 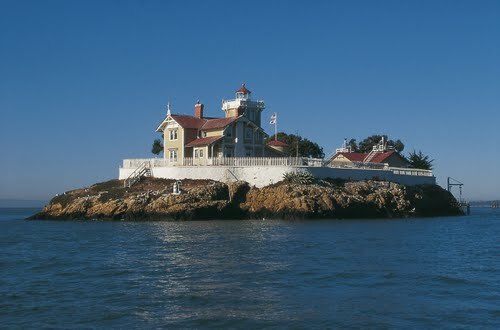 Today, the island has a far more congenial air then the days when San Francisco was a wild Gold Rush town; the original lighthouse was decommissioned in 1969 when a modern, automated building was constructed, removing the need for a lonely keeper to watch for fog and heavy weather. After the upgrade, the government had wanted to simply demolish the old structures, but public outcry led to their preservation and a listing on the National Register of Historic Places in 1971. The old Victorian home on the island now been transformed into a charming bed-and-breakfast, with all proceeds going towards protecting this historic way station. Five rooms are available for guests on the island, each with its own unique personality and named for its window’s views. Four are located in the former keeper’s quarters in the elegant Victorian home; Marin, San Francisco, Two Sisters (a matching pair of isles across the bay) and West Brother, the island’s nearby twin, home only to a thriving colony of seabirds. Another room, known as Walter’s Quarters, is a tiny, nautical-themed room hidden in the fog signal building, just 25 feet from the main house. Available for $355 per night, this private hideaway is the most requested room on the island from repeat guests. Beauty surrounds the island, of varying natures; just to the west is its small, uninhabited twin; to the east, the peninsula of Point San Pablo, home to a small historic whaling community dotted with houseboats, and a yacht club. The harbour is the entry way to East Brother, and in the marina’s Sportsmen’s Club, the walls are filled with images depicting the island’s evolution through the decades. The southern view is dominated by the Richmond-San Rafael Bridge and a sprawling skyline filled with tall towers; the island is, for all its quaintness, less than an hour from downtown San Francisco. It’s when gazing towards the north, however, that the fantasy of East Brother’s remoteness is reinforced, with amazing vistas of the rolling, seemingly untouched hills of Napa and Sonoma counties, famous for their vineyards and rustic lifestyle. It is this northerly view, rather than the urbanized picture to the south, that most reflects the island’s true character; part of an exciting and wild California past that, through places like East Brother Light, will never be forgotten.